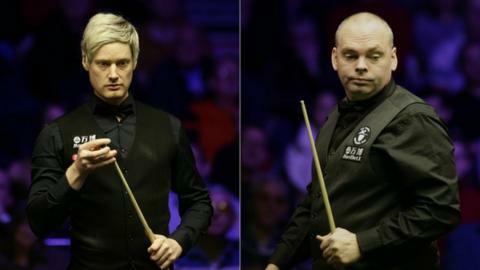 Neil Robertson will play Stuart Bingham in the Welsh Open final after a 6-0 semi-final win over Iran's Hossein Vafaei. Australian Robertston, ranked 10 in the world, made three centuries at the Motorpoint Arena in Cardiff. World number 12 Bingham produced four centuries as he beat fellow Englishman Joe O'Connor 6-2 earlier on Saturday. Sunday's final is the best of 17 frames and begins at 13:00 GMT. Bingham has made 10 century breaks in the tournament, the same number he made during his run to win the 2015 World Championship. "My game is there. Long may it continue," he said. Bingham described 23-year-old O'Connor, who beat Kyren Wilson, Ding Junhui and defending champion John Higgins in the tournament, as "probably the most promising young English player we've got now". Vafaei scored only 54 points in a match lasting an hour and a half. "Every little mistake he made I punished fully and that's what you have to do," Robertson said. "You can't let the crowd get behind the underdog. I played very well, scored heavily and I did everything I hoped to do throughout the match." Robertson, who beat Bingham 5-0 in the German Masters two weeks ago, said: "Stuart's more than capable of crushing anyone on his day. "We both play very attacking snooker. Hopefully I can get on top."